You can tell a lot about a writer from where he or she works. Writers’ desks and offices always have fascinated me. The same goes for their work habits. I’ve read that Charles Dickens wrote in a chair in the corner while his busy family ran about, but he was so caught up in the world of his fiction that he rarely noticed. 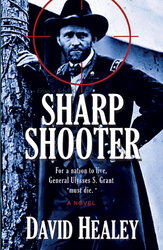 The noise was a good distraction, in a way, forcing him to focus on the story at hand. I can understand that somewhat, having worked in newsrooms for many years with ringing phones, people coming and going, and maybe the TV news on. For reporters and editors, peace and quiet was a luxury they didn’t have, except late at night after the paper went to bed. 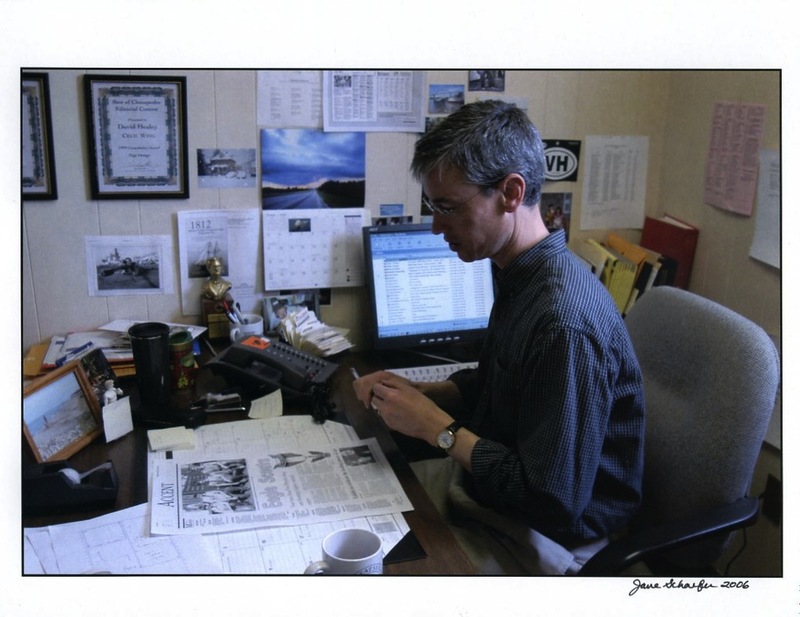 Photographer Jane Schaefer took this photo of me working at my desk at the newspaper back in 2006. Similarly, there’s a rich tradition of writers working in cafes and coffeehouses. It worked for Ernest Hemingway in 1920s Paris and it worked for J.K. Rowling. But back to writers’ desks and offices. One of my favorite books is a the photography collection “The Writer’s Desk” by Jill Krementz. 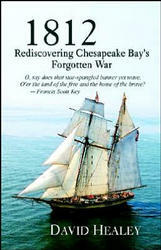 I bought it back in 1996 at Borders Books and paid the princely sum (for a writer!) of $34.95 because I knew I had to have that book. I’m just fascinated by how and where writers work. It seems very mysterious to me, and here’s this wonderful book that has captured these desks on its pages. Over the years since then, I’ve enjoyed going back and admiring the wonderful black and white photos of writers at work in their workspaces. Krementz took the photos as far back as the 1970s and sadly many of those great writers are no longer with us. The photo that appeared in TIME magazine of Steve Jobs and his office. 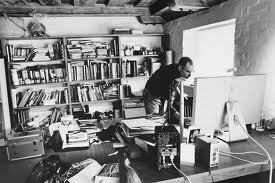 Time Magazine recently had a wonderful black and white photo of Steve Jobs at work in his home office. It was far more modest than one might expect, which leads me to believe a creative space has more to do with having a simple place to work privately and think freely than it does with matching furniture and a good view. For my own desk, I’m very lucky to have a big, sturdy table I bought years ago at a yard sale. The stamp on the bottom says it’s from the 1950s and it seems to be made of oak. It has a couple of drawers for paper clips and Post-It Notes. The desk is just the right size for piling high with books and computers, including my trusty 1992 PowerBook and new MacBook. I keep lots of pens and scrap paper handy for jotting notes. There’s a whiteboard on the wall to help remember the really important stuff, like deadline dates. Crave of the Day: Turn your desk into a standing desk! My desk is a tad high for typing, so I recently added a slide out keyboard tray that I built myself using plans I found online that involve drawer rollers and a stair step. It’s a perfect height and makes typing for long stretches much for comfortable, plus it’s a nice extra space for notes and mugs of tea. That desk is a refuge of sorts. I feel serious when I sit down there. “Hey,” my mind seems to say. “You’re at your desk. Time to get writing!” It’s not perfect, and not terribly photogenic, but it works for me. This entry was posted in Writers & Writing and tagged writers at work, Writing, writing desks, writing habits. Bookmark the permalink.